In 1967, The Triumph TR4A sports car was finally discontinued. This created a problem for Morgan since their Plus 4 was currently using the 2138 cc engine from the TR4A. Matters were made worse when, in 1968, Triumph launched their TR5 and TR250 range of sports cars, powered by the 2.5 litre, straight 6-cylinder engine, which was unable to fit into the engine bay of the Plus 4. Consequently, as Morgan began the search for a replacement engine, Rover offered their aluminium 3.5 litre (215 cubic inch), V8 unit. Following additional development work involving increasing the wheelbase by 2 inches, and widening the chassis slightly, a way was found to squeeze the new unit into the Plus 4's engine bay. Furthermore, the back axle was uprated with a limited slip differential. Although the car was a little heavier than the previous Plus 4, it delivered over 50% more power. Once the prototype had been tested and cleared for production, the new model was designated the Morgan Plus 8 sports car. It was launched, in October 1968, at the Earls Court Motor Show, with the final Plus 4 being built in January 1969. The new model developed 160 bhp at 5200 rpm, with a top speed of 120 mph. Following its launch, it was greeted with rave reviews from the motoring press and, for a number of years, it was the UK production car with the fastest acceleration. Early Plus 8's had a compression ratio of 10.5:1, and were fitted with two SU HS6 carburettors. Between 1968 and 1972, it was fitted with the same Moss four speed gearbox, with synchromesh on the top three gears, as had been used in the Plus 4. In 1969, it was fitted with a twin exhaust system and, a year later, gained US approval. From 1972, it was replaced with an identical Rover four speed gearbox, with synchromesh on all forward gears, as used in the Rover 3500S saloon. In 1973, the compression was reduced to 9.25:1, with a corresponding reduction in output. In 1975, to complement the standard model, the Plus 8 Sports Lightweight variant was introduced. However, only 19 were built. In 1976, it was powered by the Rover SDI, 3.5 litre, V8 unit, whose cylinder block had been modified, and which developed 155 bhp at 5250 rpm, with the compression ratio now increased to 9.35:1. The original 15 inch wheels were replaced by wider, 14 inch wheels, and the chrome bumpers were replaced by an aluminium version. In 1981, the two SU's were replaced by two Stromberg carburettors, with a small increase in output. In 1983, attractive 15 inch wheels made a return, fitted with a Morgan +8 motif. Interestingly, since Rover continually updated its V8 engine then, because Morgan was averse to modernizing its cars, all it had to do was ensure the Rover unit would fit in the Plus 8's engine bay. All models featured front disc brakes and rear drums. In order to comply with strict US emission regulations, from 1974 to 1992, all Morgans exported to the US, of which around 98% were Plus 8's, were converted to run on liquid proprane by the local distributor. Tanks of the liquid gas were positioned behind the rear bumper of the Plus 8, and performance was unaffected. Over the years, the popularity of the Plus 8 sports car has been regarded as one of the reasons for the continued viability of the company. Throughout the 1950's and most of the 1960's, the majority of Morgan production was exported to the US, whilst demand for its cars in the UK and Europe had sadly declined. Fortunately, with the introduction of the impressive Plus 8, demand in the UK market was re-established. 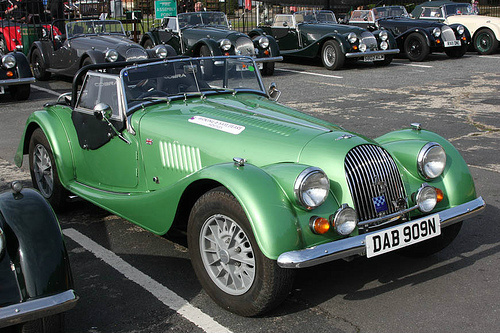 From 1968 to 1986, a total of 3,506 Morgan Plus 8's were built. 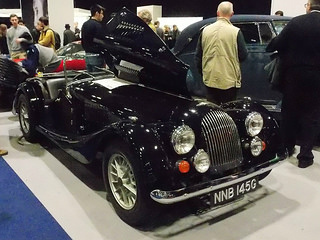 A 1970 Morgan Plus 8 carefully maintained was priced at £35,000/$55,000. On the other hand, an early 80's Plus 8 in good condition would be valued at £30,000/$50,000.